Saturday Night Live has lined up its December episodes, revealing the hosts and musical guests for the upcoming shows. Former Game of Thrones actor and current star of Frontier, Jason Momoa, will host on December 8. That same night Mumford & Sons will perform as the musical guests to promote their new album Delta. The following week, Matt Damon will return as the host on December 15. He previously hosted the show in 2002 and has since returned for multiple cameos — most recently to play Brett Kavanaugh in a sketch about his senate committee hearing. Mark Ronson and Miley Cyrus will perform as the musical guests that night, debuting a new collaboration. 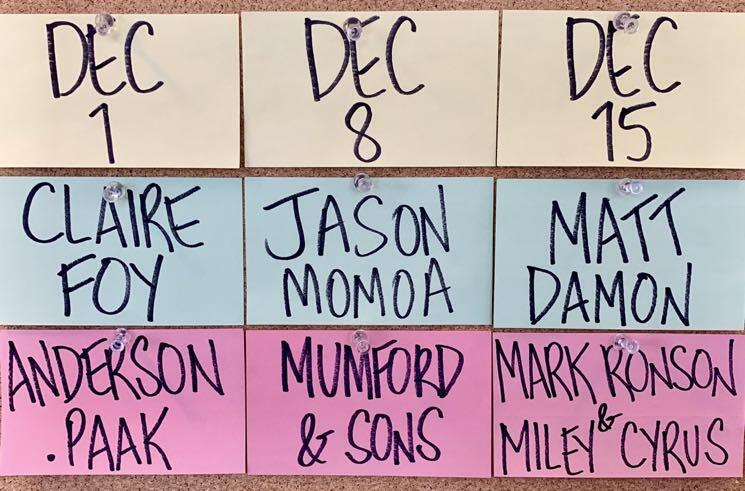 As previously announced at the end of last week's episode, December will kick off with a hosting gig by The Crown's Claire Foy and a musical performance by Anderson .Paak. See SNL's Twitter announcement below.